THE UNDERLINE – LET’S GET IT STARTED! You are at:Home»Topics»News»In The News»THE UNDERLINE – LET’S GET IT STARTED! The Underline is the name given to THE project to create a 10-mile urban trail and linear park from the Miami River to Dadeland South. Friends of The Underline a 501(c)(3) non-profit advocating to transform the underutilized land below Miami’s Metrorail into a 10-mile linear park, urban trail and canvas for artistic expression are gearing up for a busy year full of fun activities and events to keep the community exciting about the future Underline. 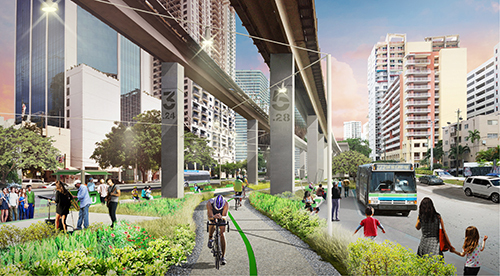 MIAMI-DADE COUNTY WILL START BUILDING THE UNDERLINE! What happened leading up to this important moment? • Underline master plan was completed in 2015 after a series of 6 public meetings, community input and overwhelming political support. • Phase 1, Brickell Backyard from the Miami River to Coral Way, design and engineering drawings by James Corner Field Operations and Kimley Horn were completed in 2017 with a robust public process. • Project designs were permitted with over 40 approvals. • Miami-Dade County procured a contractor. The lowest bid was accepted and the County Commission’s Transportation Committee unanimously approved the contractor award. • We have had hundreds of free community health and wellness and cultural events. • If the contractor award passes at County Commission on October 2nd, we will announce our big groundbreaking day soon! Be sure to follow us on Facebook, Instagram and Twitter @theunderlinemia for updates. And, also sign up at theunderline.org for more info. For all of you who donated, volunteered and supported us and The Underline, THANK YOU FOR YOUR HELP! October 13, 10 AM, Brickell City Centre, we have UnderFit Yoga. 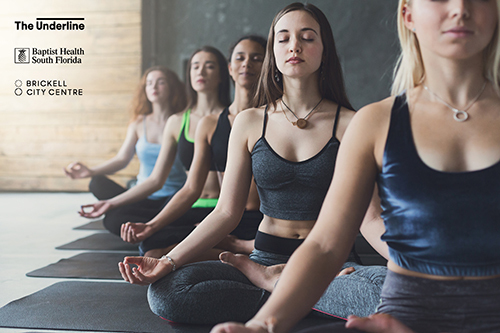 With three teachers, plenty of space to perfect your poses, music and guided meditation (there is even a family corner with an instructor for the little ones) this is a must-attend monthly event. October 14th, 10 AM, we have a family-friendly group bike ride from Dade Heritage Trust through the historic neighborhood of Shenandoah. On our September ride, participants said they learned about areas in Coconut Grove they had never seen before! October 20th, 10 AM, Walk The Underline with Founder Meg Daly from Hotel Atton to the Miami River. Meg will share design drawings and plans for Phase 1 Brickell Backyard and get feedback and ideas on programming. Kids of all ages and dogs are welcome. All events are free and powered by our partner Baptist Health South Florida. When you register on Eventbrite, please consider making a tax-deductible contribution to Friends of The Underline to support our programming and advocacy efforts.